The progressive city of Mount Isa is the most important industrial, commercial and administrative centre in outback Queensland, the second largest state or territory in Australia. Situated 977 kilometres west of Townsville, Mount Isa is an important railhead; has an airport with facilities for Jets and is a key road hub for the extensive system of highways linking Brisbane, Townsville, Alice Springs and Darwin. Mount Isa began as a mining town, following the discovery in 1923 of substantial deposits of lead. It is now one of the world's top ten producers of copper, silver, lead and zinc. Development has kept pace as prosperity increased. Apart from mining, the gulf region's major industry is beef cattle grazing. Beef roads, which service the northern Gulf properties, converge on Mount Isa which, is also an important retail service centre for the surrounding pastoral towns and properties. The city has grown to be a modern, well-appointed centre of 23,000 people. It is a very cosmopolitan place, with 56 different national origins living and working together in harmony. In August 2003 in the heart of Mount Isa, North West Queensland, Outback at Isa, opened its doors to visitors. The Tourism Centre provides an array of exciting tours, activities, and attractions. The construction of Outback at Isa, and in particular the Hard Times Mine was prompted by the closure of the Mount Isa Mines (MIM) underground tour in 2002. Visitors were still seeking an underground experience to know more about the history of Mount Isa. Outback at Isa and Hard Times Mine was the vision of the former Mayor of Mount Isa City Council (MICC) Ron McCullough, and his Council. The Queensland Heritage Trails Network program with Queensland and Commonwealth Government funding, partnered with MICC and numerous generous corporate sponsors to fund the project and to proceed and after considerable toil and effort on the part of an army of volunteers, contractors, businesses and all tiers of government the project was completed. Outback at Isa began offering the Hard Times Mine underground ours in March 2004. Participants in the Underground Mine Tour go deep into mining country and experience a day in the life of the famous Mount Isa miners. Real miners guide visitors through 1.2 kilometres of tunnels, the history of Mount Isa mining, and the unique experiences in the mine - visitors get a buzz out of having a go at operating the air-leg drill, hearing the roar of the machinery, and feeling the earth move with the firing of the drill face. In addition, visitors see, hear and feel the heritage of Mount Isa come to life in the interactive multimedia Isa Experience Gallery and learn more about the indigenous, pioneering and mining history as told by those who have helped create it. Outback at Isa also introduced an expanded and reinvigorated Riversleigh Fossil Centre. Since 1995, the Riversleigh Fossil Centre had been providing a must-see experience to visitors to Mount Isa with its interpretation of, and fossil exhibits from, the World Heritage-listed Riversleigh Fossil Fields some hours north of Mount Isa. Stories and images of flesh-eating kangaroos, giant carnivorous emus, two metre tall wombats, and marsupial lions astound visitors to the Riversleigh Fossil Centre. Tours are available through the Centre's laboratory to learn more about these extraordinary creatures and their fossilised bones now being released from limestone rocks in vats of acid in the laboratory. 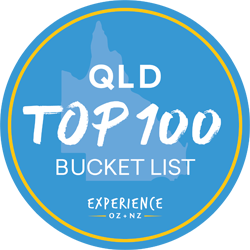 The Outback Park features plants endemic to the region with the centrepiece of the Park and entices visitors to enjoy the vistas across the lagoon, complete with large barramundi, fed by a Lawn Hill inspired waterfall cascading into the lagoon. Cultural activities are held regularly in the outdoor amphitheatre. Outback at Isa operates the Mount Isa region's accredited Visitor Information Centre (VIC), providing vital tourism information on Mount Isa and the region in a welcoming and friendly manner - the VIC has become either first point of call for visitors arriving from the Northern Territory to explore Queensland or last point of contact for those leaving Queensland to visit the Territory.